This Low Carb Breakfast Salad is packed full of flavor, nutrition, and its vegan! Now please don’t worry, I am not even remotely entertaining the idea of going vegan. I actually made the salad and it happened to be vegan, lol. Next time I may add a big piece of steak or chicken, but sometimes in the morning, I just want a bunch of veggies! I started this low carb breakfast salad with a bunch of kale. Now raw kale is not very tasty IMHO. It is bitter and tough to chew. What I do to make it palatable is toss it with a couple of tablespoons of olive oil and let it sit for about half an hour. This makes the kale so much tastier! Kale is so hardy, you can mix this salad a few days in advance and the kale will hold up to the dressing without getting soggy. The strawberries will also infuse their flavor into the salad and the flavor is just so fresh and delicious! The combination of the slightly bitter kale, the sweet strawberries, the balsamic, and the pecans is absolutely scrumptious. I have been enjoying this low carb kale salad after a long morning walk. I’m usually not very hungry in the mornings (side effects of a low carb diet), so I go on my walk around 8am, drink some coffee around 9:30, then I will wait until around 10:30 or 11 to eat my first meal. There is just something about walking outside that is so enjoyable to me. I hate any other form of exercise. 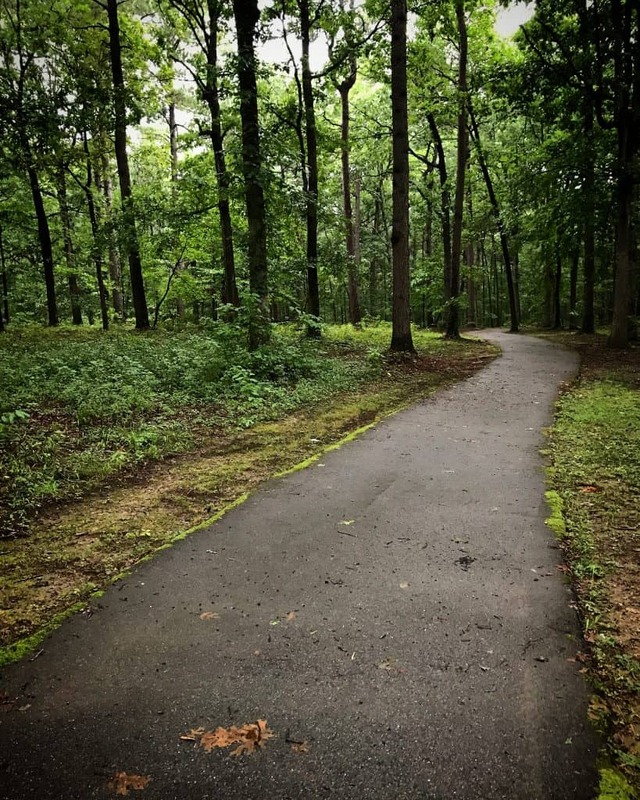 I found a nice shaded and paved path at a park not to far from my house and I look forward to my morning walks now! Here is what I look forward to…isn’t it beautiful! If you want a heartier salad, please check out these delicious salads also on the blog! This low carb breakfast salad is full of fresh kale, strawberries, zucchini, and pecans. So nutritious and a perfect healthy start to your morning! Add chopped kale, 1/2 tsp salt, and 2 tbsp of olive oil to a bowl and toss. Let sit for 30 minutes. 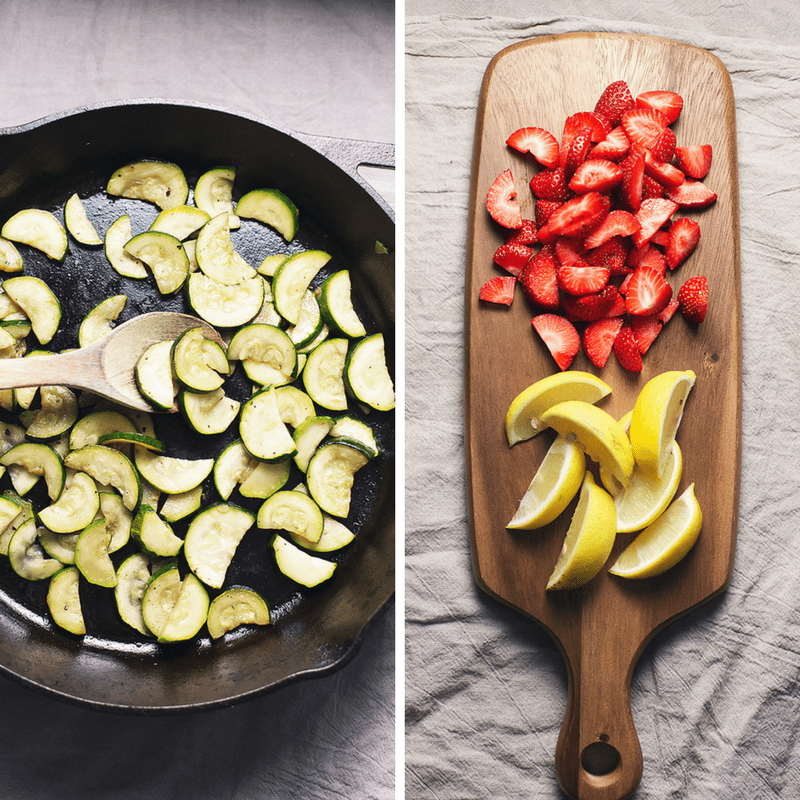 Cut your zucchini in half lengthwise, then cut into half moon shapes about 1/2 in thick. Saute in 1 tbsp olive oil and 1/2 tsp of salt over medium heat until cooked through and soft. 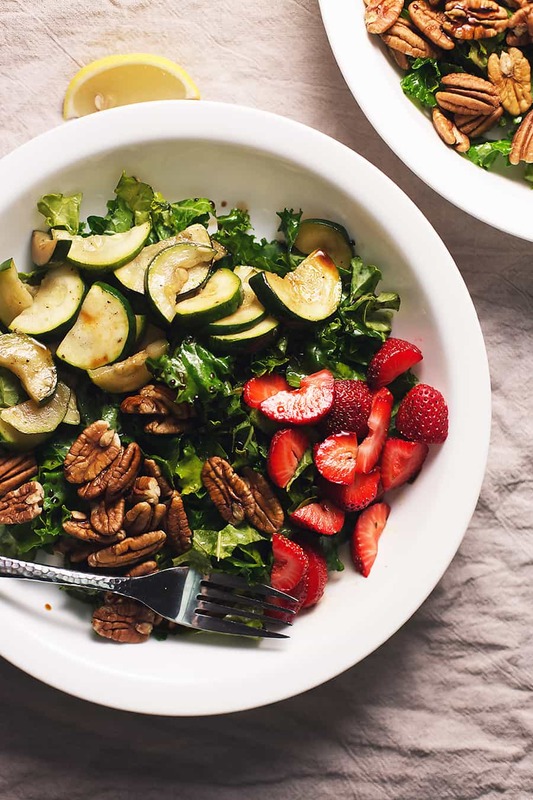 Add the kale to 2 large salad bowls and top with 1/4 cup strawberries, 1/4 cup pecans, and half of the zucchini. Drizzle each bowl with 1/2 tbsp balsamic. Squeeze 1 lemon wedge over top.